If there is a coarse fishing article that you would like to see featured on Fish South West, please send it via the contact page by clicking the link below. 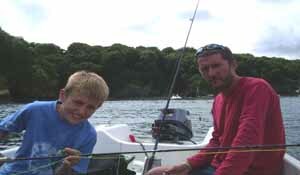 Thought it was about time to drop you a line and tell you about one of our fishing trips. Connor lives in Durham so every three weeks, I take the long trip north, inevitably we head for the hills or the sea. One of our favourite places is Bamburgh and nearby Seahouses in Northumberland. To most southerners whose travels barely go further than the M25 Northumberland is a jewel in the crown, with incredible scenery and historical interest dating back to Roman times. The vast engineering feat of Hadrians wall still crosses the county and in places is still in magnificent detail. Anyway our fishing weekends are spent on the East coast about 15 miles due south of Berwick approximately 20 miles from the Scottish border, we’ve tailor made our trips so that our weekends here for about 6 years have pretty much the same format. Arriving in Bamburgh for Friday evening we stay with Ken and his beautiful Brazilian wife Chris at the Mizen Head Hotel. Everyone is very welcoming and the Black Sheep Ale flows like a spring cascading down a mountainside. Friday always has the bonus of a quiz with all proceeds going to a local hospital for children, Connor and I always fancy our chances. After a deep and comfortable sleep and a hearty breakfast of Craster Kippers we normally take a walk on the beach below Bamburgh Castle which stands as one of the most magnificent Norman castles in England to whet our appetite for the fishing ahead. After that it’s off to Seahouses designated as an 'Area of Outstanding Natural Beauty' which bustles by day. The harbour has an assortment of boats offering trips to the nearby Farne Islands or for exciting fishing only 2 miles of the coast. Three Companies (see below) offer 3 or 6 hour trips from £10-£18 with additional charges for rod hire. As with all boats they can be a bit hairy and last time out Connor was sick as a dog which was a shame as it curtailed his willingness to haul in copious amounts of codling which abound on the bottom. Having fished with all 3 companies they all offer the same principal for a good day out by using a heavy ledger to get you to the bottom and three mackerel feathers at the business end. The results can be dramatic, if you fish mid depth there seems to be an endless supply of Mackerel which all seem bigger h and the bottom brings the rewards of some hefty 2lb to 3lb codling. Put it this way if you get into a full house you know about it. As with all fishing trips they always end to quickly and it’s back to Seahouses and the stability of the Northumberland Coast. Last time out we took about 10, 2/3lbs codling, a couple of large wrasse, 1 haddock and about 8 mackerel, remember to keep an ice box in the car, and then visit the co-op on the High St to get your ice. If all goes horribly wrong you’ve still got Pinnacles, probably the best fish and chip shop in the world, where you can sit down and discuss your fishing adventures. Believe me you should fill your ice box quite comfortably on one outing but you’ve always got Sunday to try again. Alternatively there’s good fishing from the beach using rag worms or peeler crabs or what we normally do is head off into the hills and explore the countryside. Look out for my article on Kielder water which offers again scenery to die for and fishing which is hard to beat (not that I catch much)!! If you’ve caught to much codling and are wondering what to do with it check out my fish cake recipe, it always tastes nicer when you’ve caught it. Filet your cod and skin it, remove any left over bones and poach in milk with some Bay leaves. Peel the potatoes and boil. Finely dice the onions, Chilli, red pepper, garlic and ginger and put into a mixing bowl. Drain the cod and add to the mixing bowl with the crab meat and potatoes. Add the egg, salt and pepper and chopped coriander. Mix all the ingredients together to create a firm consistent ball. Divide your ball into small patties and flatten out before shallow frying in Sunflower oil until golden brown. Serve with a green salad. A great article to kick off by Jim although he doesn't seem to grasp that this is a coarse fishing site. Still, seeing as he is such a great mate, I'll forgive him just this once. By the way, I have tasted his cooking and can assure you he knows what he's talking about.